Abdul Muqeet, also known as the Paper Bag Boy, has risen from being just another ordinary student to an extra-ordinary environmentalist. Ten-year old Abdul Muqeet has demonstrated remarkable commitment to saving the environment in the United Arab Emirates and elsewhere, and has been a poster-boy for environmental campaigns in the Middle East. Here he shares his views on environment, recycling and public awareness. It is said that you should break your goals down into small steps which you can accomplish each day. Set a goal, and approach it in a simple and basic manner. When I started my environmental campaign couple of years back, I had no idea that within a short span of time I would be invited to UNEP Tunza Conference in Indonesia or a film featuring myself will be run at CoP18 in Doha. My endeavor began with collection of old newspapers and then making simple shopping bags out of it. My main objective was to spread environmental awareness and educate people about the harmful effects of plastic bags. Public awareness is essential to the success of any waste management program as people will start caring for the environment only on realizing ecological and health impacts of their day-to-day activities. Industrial pollution, environmental degradation, water scarcity, climate change are some of the burning issues nowadays which, if not tackled, will have serious effects on the coming generations. Plastic wastes, as you may be aware, as one of the biggest source of pollution nowadays. We must not use it for our convenience; rather have the commitment to avoid the usage of plastic. Let us discuss some of the major harmful effects of Plastic. The decomposition of plastic takes a very long time, running into hundreds of years. 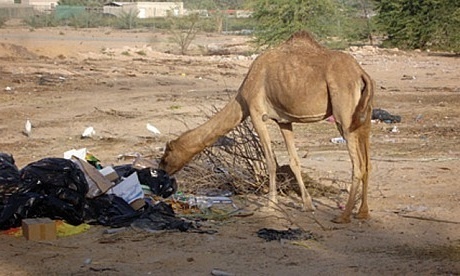 When we throw plastics all around, animals like camels and cows eat these plastics which choke their digestive systems ultimately leading to a painful death. Our drainage system is also blocked by accumulation of plastic wastes thus making our city dirty. Another important issue in that of global warming, i.e. emission of harmful gases like carbon dioxide, methane and carbon monoxide. The safe limit for carbon dioxide in the atmosphere is 350 parts per million (ppm), but it is rapidly increasing day by day, and has reached high level of 392 ppm. A tough time is in store for humans if the carbon dioxide concentration reaches 400 ppm as the resulting temperature rise will aggravate melting of glaciers. I would like to share few basic tips that may help us in reducing plastic consumption in our daily time. First of all, say NO to plastic, use eco-friendly bags for your shopping. Shopkeepers can start charging for plastic bags so customer will re-use bags again and again. Many companies use lot of plastic packaging to attract customers which could be avoided by implementing more creative ideas of marketing. Many supermarkets and packers unnecessarily use excessive amount of packaging which should be discouraged. Any small action to save our Mother Earth would make a big difference to humanity. I believe that we all shouldn’t think about how I as a single person can save the earth, rather we should all believe that each one of us can make a difference by doing our part towards the environment. As our president, Sheikh Khalifa Bin Zayed Al Nahyan said “Saving Climate, is not the responsibility of the government alone, it is the responsibility of each and every person, every citizen to save the environment. We all should realize our duties and responsibilities towards conservation of natural resources. A small step in our day-to-day life can make a big difference for the environment. It is our sole responsibility to care for Planet Earth and make it a better place to live for the present and future generations. I humbly request you to join my campaign to stop use of plastic bags. Say NO to Plastic, and insist on eco-friendly bags. You can also give me more ideas how we can work together for a better future. Our late Baba Sheikh Zayed bin Sultan Al Nahyan (may his soul rest in peace) was very keen to save environment and trees. He changed this land from desert to a lush green place which we enjoy today. He once said that man has to be kind not only to humans but also to animal and plants, as God bestows kindness on those who show kindness to others. Hence, we all should follow his footsteps and make sure do our best to save environment. Last but not the least, I would like to remind one and all that Everything on Earth can be Recycled but not Time. So please dont waste time, act as fast as possible to save the Environment. Tagged Abdul Muqeet, Abu Dhabi, conservation, emissions, environment, Global Warming, Green, Middle East, Paper Bag Boy, Paper Recycling, Plastic Wastes, Recycling, Sustainability, United Arab Emirates. Bookmark the permalink.